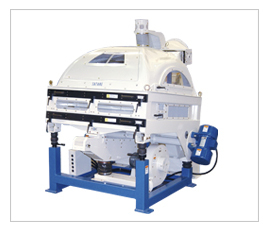 The Satake Destoner SGA separates stones and heavy impurities from grains, utilizing bulk density differences. Rigid heavy duty construction with Solid Performance thicker steel plates and a sturdy frame ensures long life. This is the ideal machine for separating stones from grains in an efficient, trouble-free manner. Heavy-duty construction, (side View) permanent lubrication and easy access to sieves for cleaning or Replacement result in very low maintenance.